Anyone know a way to disable screenshots? I just upgraded to a Nokia Lumia 950xl. After 2 frustrating days of constantly opening the stupid feedback hub, I've got that uninstalled, now its just taking screenshots every time I go to turn the screen off. Is there anyway to disable/uninstall/or at the very least re-map the stupid screenshot keys? Having it be a button I use 10 times an hour is a pain in the @&#. Re: Anyone know a way to disable screenshots? Afraid I've never seen any options for this in the settings. Perhaps there's a registry hack but it's not something I know about. Screenshot is power + volume up, so if you're pressing only the power to shut off the screen and it's taking a screenshot, then there's a hardware problem. You can also double tap the navigation bar to turn off the screen: go to Settings\Personalization\Navigation bar to enable. I use it much more frequently than the power button. Thanks, spicypadthai! You're a lifesaver! It never even occurred to me there'd be an easier way to turn the screen off, but that just neatly avoids the whole mess-O-buttons all together! Its not the solution I was hoping for, but its good enough. I miss my 1520, with the power button AWAY from the volume keys. I never even knew these combinations existed. And I was happier with my phone for it. Anyway, I'll just double-tap the bar going forward, will take me some time to get used to but at least I won't be taking 50 screen shots a day. Wow, never knew that. I've taken hundreds of unnecessary screenshots. I hated the button placement. I still use the 950xl and the power button is my biggest issue. So you had been pressing both volume up and power buttons to switch the screen off? Anyway, combine small button size, crowded button placement, and ANY kind of protective case, and yes, you will hit 2 of those buttons every time. Now, if each button only did the thing that it was designed to do(E.G. power button turns off screen, volume button effects volume) this wouldn't be an issue. But since these buttons have been roped into completely useless combo effects that CANNOT BE DISABLED, it creates a huge hassle. 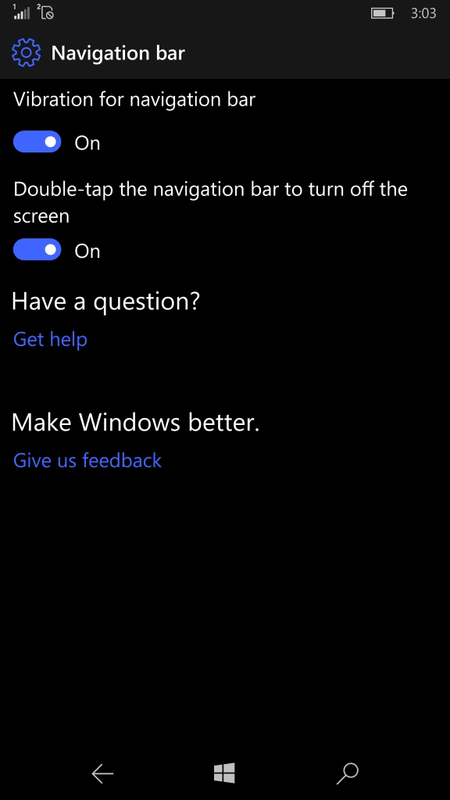 As a result, I am now cut off from the feedback hub and have to use a different method to turn off the screen. All because Nokia poorly-placed the buttons and Microsoft made an always-on option for a very seldom used feature. My only question is: Did you take that screen shot intentionally? The windows phone user-base isn't very big, the Lumia 950xl base is even smaller. Note that as soon as I brought it up, user PerfectReign chimed in to say he had the exact same problem. Its really easy to take that screenshot and not know it. Most users are probably either suffering in silence, or occasionally wondering why their photo album is littered with screenshots.